“Johnny is in the 85th percentile in height and weight.” Your pediatrician delivers the news in such a matter-of-fact tone. It must be significant. You tuck the information away to bring up at the next group playdate. Baby growth percentiles. Are you familiar with them? They’re those charts your doctor uses to compare your child’s development to the averages of other children in the country. He will keep a growth chart plotting your baby’s progress from visit to visit. Why does your baby need to be compared with other babies in the country? For the most part, he doesn’t. But, comparing your baby’s height, weight and head circumference to those of other children gives the doctor a reference point. We have a few facts about the growth percentile you might like to know. The vast majority of babies fall in the normal range, which is between ten and ninety percent. There are many reasons a baby is on the low end of the chart. The doctor will want to check to be certain there is nothing serious going on and will devise a plan of action from there. There are only three likely causes for babies to be in the 90th percentile. Number one being maternal or gestational diabetes. The other two factors are maternal obesity and fetal abnormalities which are often caused by certain syndromes. Ultimately, your baby’s birth weight does not determine their growth potential. It’s, mostly, genetics. As long as your baby is happy and healthy, the long and short of it all is neither here nor there. You shouldn’t give “too big” or “too small” much thought, either. Humans come in all shapes and sizes. So, eat healthy, stay active and relax, Mama. Your baby is just right. ? Don’t let the unknown weigh you down. 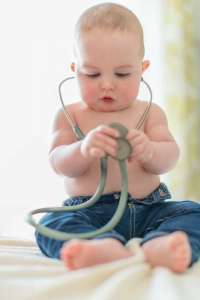 At NewbornCourse.com, you will find the knowledge you need to succeed! Our doctor approved parenting courses are interactive and we have downloadable resources available, too. Talk about tipping the scale! At $39.99 for a six month subscription, you will receive a wealth of information. Contact us today!